RSVP for the Thank Goodness It's Over Party, December 8th. Need to write some more? Consider taking up the 18K challenge and possibly win a dragon zipper pull! Be sure to come out November 25th for the last of the Nichols Library write-ins (Naperville), 1:30 pm-4:30 pm (but feel free to show up when the library opens at 1 pm). Afterwards, consider going out to the Blue Box Cafe for Sam's write-in + Doctor Who episode viewing. The NaNoWriMo HQ staff and forum moderators work very, very hard to make NaNoWriMo such a productive, fun and fulfilling event worldwide. Please take a moment to thank them today for their great efforts. Come out to the All Day Write-In (November 17th), 8 am-3 pm at the Naperville Municipal Center, room B. And, afterwards, come out to the mid-month meet-up. Join us this evening (2018-11-16) in Carol Stream or Woodridge for the Dueling Libraries After-Hours Write-ins. Carol Stream will have pizza (but please RSVP) and Cee-Bee will bring her marvelous hats for the Woodridge write-in. RSVP for the All Day Write-In, Saturday, November 17th (8 AM-3 PM, with a pot-luck lunch+snacks). On Sunday, Nov 11th, come out to Nichols Library in Naperville, 1:30-4:30 PM, for NewMexicoKid's write-in. Nichols is providing coffee and hot water and Tim's bringing cuties, magnet and owl zipper pulls word war prizes. Be sure to RSVP for this Friday's (Nov 9th) Two Brothers Roundhouse write-in (hosted by Sam) (Aurora). Monday, November 5th: Sam is hosting the writing at the Glen Ellyn Public Library (GEPL), 5-9 PM. Coffee and bagels! Sunday, Nov 4th: see you at La Grange Park (hosted by Jenny), Nichols Library (Naperville) (hosted by Tim) or Kathleen 2.0's Chill 'n Write (hosted by Kathleen 2.0). naperwrimo.org/events has logistics. Or you can join the chat room for the online writing and word wars. 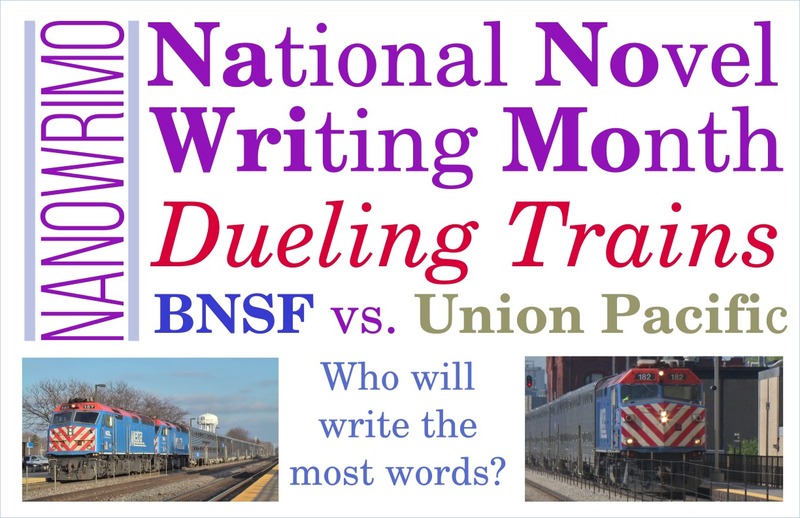 Be sure to RSVP for the Nov 3rd Dueling trains from Glen Ellyn and Naperville to Chicago so we know to look for you and meet up for the day of train and cafe-based writing. Be sure to RSVP for our pot-luck lunch NaNoWriMo kick-off this Saturday, October 27th, 11:45 AM-3 PM at the Naperville Municipal Center. Be sure to come out for our fourth and final preparatory workshop: Show and Tell, It's Not Just for Kindergarten, presented by published author j. leigh bailey in collaboration with the Windy City Romance Writers of America. 1-3 pm, Saturday, October 20th, Nichols Library in Naperville. We have two preparatory workshops this weekend: Saturday, Oct 13th, Jennifer Smith will lead a workshop on how to outline your novel (1-3 pm, Nichols Library in downtown Naperville); and Sunday, Oct 14th, 1-3 pm, Glen Ellyn Public Library (GEPL), Daniel McCullough will lead a workshop on The Part Where They Talk To Each Other (an interactive workshop on dialogue). This Saturday (Oct 6th) is the first prep workshop: the innovative Chunky Method of time management, presented by award-winning bestselling author of over thirty books, Allie Pleiter 1-3 pm at the Nichols Library in Naperville. We have some excellent preparatory workshops coming up in October and, while supplies last, participants will get this year's version of our hipster PDA, chock-full of new content to help with your novel prep, writing and post-NaNo work. There is a free Writer's Voice Workshop June 16th, 1-4 pm, Woodridge Public Library (registration is required). It's fun and rewarding! Come on out to learn more about your writer's voice. Be sure to RSVP for the Thank Goodness It's Over (TGIO) celebratory party December 9th. Only those who RSVP will be entered into the drawing for door prizes! Please take a moment to thank the hard working NaNo staff for all their great efforts in hosting NaNoWriMo! Just head over to Staff and Mod Appreciation Day and post! What do you want to do once NaNo ends? Consider joining the (free) Writing Journey community. We have many Paths to offer and are always open to ideas for new Paths. Take the squid challenge and win one of Squiddish's cookies at the TGIO! Just put a squid in your novel and post a snippet! Be sure to come out to one of our write-ins! See http://naperwrimo.org/events for the calendar with logistics. Many of the library write-ins are part of the Library Crawl, where you can collect cards that you can redeem at the TGIO party (December 9th) for chances at winning prizes. Don't forget to RSVP for the October 28th Kick-off party! Only those who RSVP will be eligible for the door prizes. It's a pot-luck lunch and will be plenty of fun. Coming this weekend: prep workshops #2 (1-4 pm, Glen Ellyn Public Library, Saturday, Oct 14) and #3 (1-3 pm, Nichols Library (Naperville) on Sunday, Oct 15). Come out and prepare for NaNoWriMo! Don't miss our first prep workshop of the fall October 7th, 1-3 pm, Nichols Library in downtown Naperville. Join writer Anna Gabrielli for this informative workshop on character as intertwined with their world / general worldbuilding for any genre. Bring some paper and something to write wtih for the writing exercises. Please take our 2016 post-NaNo survey to help us improve NaNo for you for next year. Thanks! For those coming to the TGIO, don't forget to bring your Library Crawl cards and your stuffed animal for the group picture! Consider joining the Writing Journey, our region's (free) year-round writing group. It is a diverse, eclectic, vibrant and welcoming creative community. Be sure to RSVP for our fun-filled December 10th pot-luck lunch Thank Goodness It's Over celebration! Take the 18k challenge (3000 words per day for the final six days of NaNo!) and win a special button! Come join Sam Brown (Basil Cliffside) and Kaden Patrick (KadenPeregrine) for the all-day write-in! You don't need to stay the full time. Bring your laptop, extension cords and consider bringing some food to share in this comfortable, friendly write-in. We will be going to Whole Foods Market after the Municipal Center. We should be there around 3:15-3:30 and will probably stay an hour and a half to two hours, depending on when people want to eat afterwards. The have 12+ tables, a coffee cart and a good amount of seating with outlets and wi-fi. For any folks who would like to change their usernames, it is now possible for users to do this (though note that the username you leave behind is not protected and someone else can then claim it). We have a lot of write-ins planned for the Library Crawl; you can see event logistics on our calendar. Write-ins can be fun, productive events for writing your novels. You can even organize your own, if you can't find one near you at a time you can attend. Bring your stuffed animal, your laptop and your novel to one today! 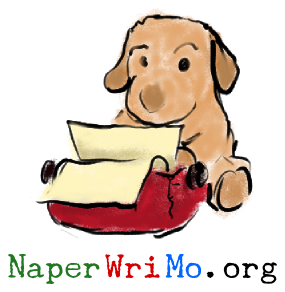 Stop by the regional chatroom to ring in the start of NaNoWriMo after midnight, October 31st. That's when the madness, the fun and the excitement begins! Don't forget to RSVP for our fun kick-off pot-luck lunch party this Saturday (October 29), 11:45 AM-2:45 PM. Bring your stuffed animal for the group photo! We'll have time for games at the end if you want to bring one. Online prep workshop 8 pm, Sunday, October 23rd! We'll do a writing prompt warm-up and some more (pre) story walls (Describe your novel idea in 5-7 sentences and ask the questions you want answers for). Just a quick note: unlike our other events at Nichols, the prep workshop on Saturday Oct 22 (led by Brian Cable) will be in a different room: NaperLaunch. This space is on the upper level at Nichols and is located behind the Computer Desk. It is between the red pillars. Come to our Slack channel Friday, October 21st for our online, virtual preparatory workshop. 8 pm CDT. For those who are coming to this Saturday's workshop on characters (2016-10-15, 1-3 PM, Nichols Library) - it would be great if you brought some kind of notebook/notepad/computer and something to write with. This event will be heavily writing/activity based! Be sure to join and test out our new slack-basd chatroom! We'll schedule a couple of virtual prep workshops soon. Just a quick reminder that Glen Ellyn Public Library is open from 1-5 pm on Sundays, so you don't have to arrive there too early for the Sunday (October 9th) Story Wall Party. It will take us a few minutes to get everything set up. See information about our FIVE preparatory workshops in October (further information is on our calendar). Prepare for November! Saturday, September 17th is the last Journey meeting of the year. Everyone is welcome to come out: 11:30 AM-3:30 PM, Glen Ellyn Public Library, bring your own lunch. There will be workshops on short story writing and on the discovery process of writing. Sam and Tim will be at a table at the Santori Public Library in Aurora 2-4 pm Saturday, September 10th. See the Aurora Public Library Catch A Bunch Of Authors event page (their event runs 1-4 pm) and also consider signing up for their Success With Independent Publishing workshop that morning, 9:15 am-11 am. Short story writers and poets: consider participating in the 2016 Journey Anthology (aka Anthology 12). Stories and poems are reimagined, inspired by classic tales. Check out the schedule of Writing Journey events, all free and open to the public. January 23rd is our kick-off general meeting at the Woodridge Public Library. For those who missed it, please see the pictures and video from our fabulous TGIO! If you have a chance, please help us improve by taking this short survey. And it's not too late to join the Journey, our year-round writing group. Congratulations to TRRDEDEAN for being first on the board with words written on the first day of the six day 18k challenge! Photos from the Woodridge and IPPL write-ins yesterday (2015-11-21). 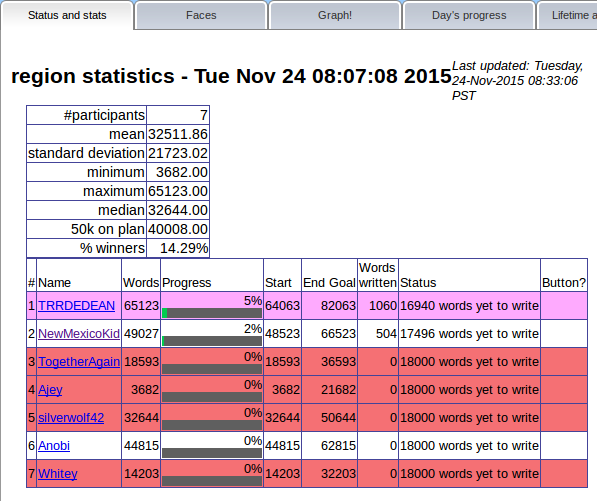 Be sure to sign into our word count tracker for write-ins (naperwrimo.org/wordcount) to help facilitate word wars. And bring your stuffed animal with you to write-ins! Typin' Away Again Near Dear Ol' Naperville is our song; our region represents the cities and suburbs west of Chicago (not just Naperville).